John Hartley discovered his life’s passion while growing up in Piqua, Ohio. Encouraged to develop his talents in an academic environment, he moved to Fort Worth, Texas in 1982 to study art at Texas Christian University. After graduation, he began building a body of work that includes paintings, prints, and sculpture. Exhibiting throughout Texas and the United States, his work has been critically received and is included in collections across the country. In 1990, the Modern Art Museum of Fort Worth purchased two of his monoprints for its exhibition, Forty Texas Printmakers. His exhibitions include shows at Kidder Smith Gallery in Boston and Martha’s Vineyard, the Arlington Museum of Art, The Barth Galleries in Columbus, Ohio, and galleries in Fort Worth, Dallas, and Houston, Texas. He continues to make art today and remains active in the Fort Worth art community. He opened Gallery 414 in 1995, an alternative art gallery exhibiting local and regional contemporary artists. He has also been a teacher and a professional art handler, working with museums, private collectors, and blue chip artists from around the world. 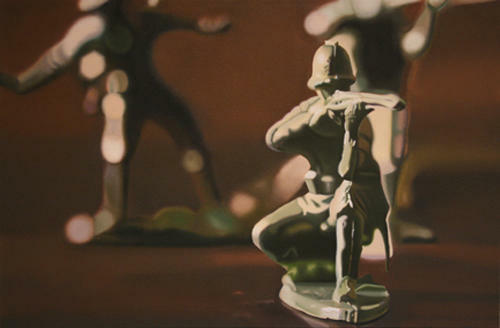 His art reflects his many interests: the human figure, toy collecting, social issues, and more. He actively promotes art education, and encourages young people to develop creative talent and thought. And he continues to explore new mediums and push his art to its fullest potential. I was born and grew up on the South Side of Chicago at the cusp of the 70’s, attended Catholic Grade school and all boys Catholic High School, things that are not so unusual growing up on the South Side of Chicago, at least at that time, actually probably the end of a certain time. After High School and a brief stint at St. Xavier University in Chicago, I moved to Peoria and attended Bradley University, where I received my BFA in Painting and Drawing. After Peoria, I moved to Seattle for 5 years prior to Graduate School at Southern Illinois University in Carbondale for my MFA in Studio Art. I am a Chicago based artist and sometimes curator. I enjoy playing with the modern psychological conundrum through the lens of popular visual semantics and contemporary archetypes in a expanded language of the landscape. Typically preferring to work in an installation format using light box photographs, shaped paintings, sculptures, found objects and video to create multifarious tableaus. Rigsby was the founder of GARDENfresh, a gallery based out Chicago. He received his MFA from Southern Illinois University in 2000, and his BFA from Bradley University in 1992. Rigsby has shown both Nationally and Internationally, most recently with Mikes Museum in New York, What it is in Oak Park, Il, (Con)Temporary Art Space, Chicago, antena, Chicago, Florida Gulf Coast University, Fort Meyers, Florida, Bridge ArtFair New York, Miami and London. He has also shown in New York, Kansas City and Tokyo.